I'm new in this world so I've never soldered anything...is it hard to soldered power cables? It's not that hard, but you need to practice. Is there something somewhere to show me how the power cables are connected on the tricopter, because there are so many cables, I can't find my way out!! Nic, get one of those power distribution boards. Very cheap, very light, VERY easy. And how am I supposed to know what goes in what channel? Have you read this guide? It goes over the whole build pretty much step by step. This is the control board you need for your tricopter. You will need male-to-male jumper wires to connect your receiver to your control board. In the image above you see that the pins to the bottom left are labeled Ail, Ele, Thr, Rud. These plug into your Rx with the jumper cables mentioned. 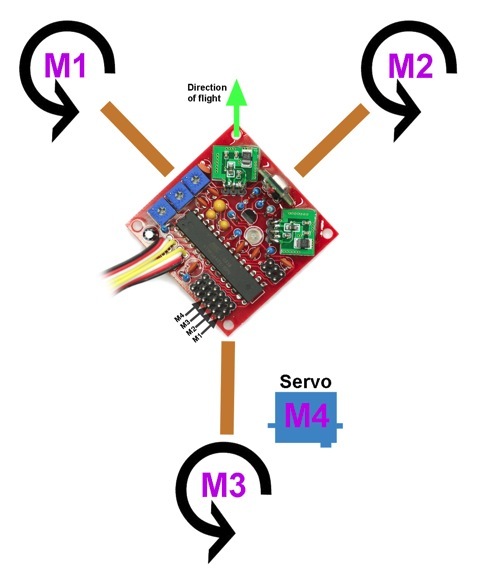 So you plug your ESC connectors into the appropriate M1, M2, M3 connectors, and the tail servo into M4. The motors plug to the ESC's. What you need to solder, are the power cables, these go from the battery to the ESC's. The red cables from the ESC's (The power cables, not the motor cables) go to the positive connector on the battery plug; and all the black cables go to the negative side of the battery connector. The KKboard needs different software to be used for a tricopter. Check the RCExplorer.se link above. Yes it really helps, so if I'm understanding, all the red cables from the ESC's need to be solder as one cable that will be solder to the battery? The thing I'm not catching is where the KK board get his power from? Yes it really helps, so if I'm understanding, all the red cables from the ESC's need to be solder as one cable that will be solder to the battery? Don't solder anything to the battery, just to the battery connector. But yes, red power cable from all esc's go into one cable that goes into the battery connector that goes into the battery. The thing I'm not catching is where the KK board get his power from? The signal wire from the ESC's works both ways. The black and red cables give power to the KKboard, and the white wire carries the signal from the KK to the ESC. I wondered the same when I was a newbier noob. To prevent current overload you should cut two of the three positive wires going to the KKboard. and there's no power coming to the receiver? The receiver is just plugged to the KK board and thats it? 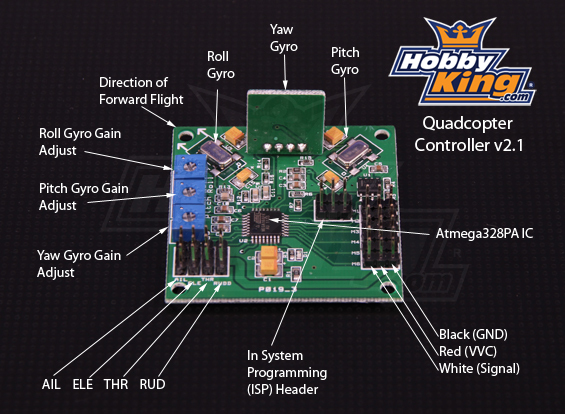 yes, your rcvr is powered from the kk board, unless you run a separate bec to power it. The small copper threads inside the KKboard lead the power coming from the ESC's along the servo jumper wires (male-to-male) into the Receiver. For everybody else. The wires we talk about are between ESCs and KK Board. Do you have some source for this? I just looked and couldn't find that anywhere. I know that you normally don't put them in parallel. But I saw nobody doing this with the KKBoards and because of that I didn't do it. I thought that maybe the KKBoard would just take one source anyway. Oh, no. The ESC servo-type cables should* be cut (on the red cable only) all but one of them. Can someone tell me how the Turnigy programming card does? Is that a must to build a tricopter? Can someone tell me WHAT the Turnigy programming card does? Is that a must to build a tricopter? The Turnigy programming card is used to set up the ESC's to the right settings. It can be done individually using just the transmitter without a Programming Card, but it's really much more intuitive to use the Card. ok and with the tricopter...what wire do I plug in? All those of the ESC's? Does the programming card always need to be plugged on the tricopter, even when flying? No it is just for setting up the esc with the settings you want. If you want to do that you have to connect the Servo Cable of the ESC to the programming card and then connect the ESC to the battery. After you have done your settings and saved/sent them you can disconnect the esc from the battery and from the programming card. It will remember the settings if you saved them. Just lookup the manual from the programming card if you buy it.